Jodie Foster stars in "Hotel Artemis," a new crime thriller written and directed by Drew Pearce ("Iron Man 3"), about a secret, high-tech emergency room for criminals. Jodie Foster runs the hotel, Dave Bautista plays her orderly, and Sterling K. Brown, Sofia Boutella, Charlie Day and Jeff Goldblum play the larger than life bad guys who stumble, bloody, through their doors. 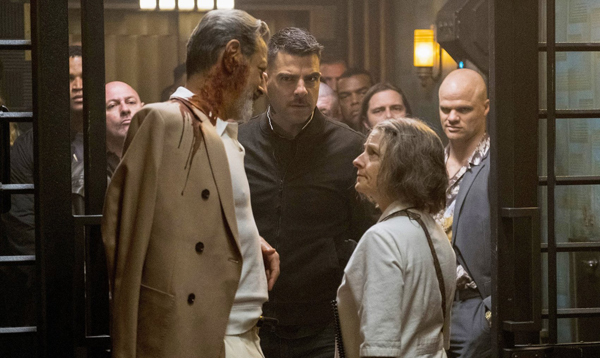 In his review, William Bibbiani says that "Hotel Artemis" is "very fun" but "hollow," and he critiques the film for its "broad-stroked characters populating an otherwise ultra-detailed fictional criminal underworld." I was going to see this anyway, but now that I know who's in it I'm totally going to see it as soon as possible. Something tells me I'll like the oddity of it.